Betsey Hillyer was born on 26 August 1784 at CT. She was the daughter of Daniel Hillyer and Elizabeth Dibble.1 Betsey Hillyer married Adonijah Holcombe II, son of Adonijah Holcombe and Charity Gillett. Betsey Hillyer died on 11 September 1859 at age 75. She was buried at New Ohio Cemetery, North Colesville, Broome Co., NY. [S546] Hillyer G. Norment, John Hillyer, Page 133. Alvin A. Holcombe was born on 29 October 1808 at Granby, Hartford Co., CT. He was the son of Adonijah Holcombe II and Betsey Hillyer. Orson Holcombe was born on 19 December 1810 at Granby, Hartford Co., CT. He was the son of Adonijah Holcombe II and Betsey Hillyer. Edwin Holcombe was born on 29 October 1812 at Granby, Hartford Co., CT. He was the son of Adonijah Holcombe II and Betsey Hillyer. Edwin Holcombe married Azubah Helding. Edwin Holcombe died on 25 April 1883 at age 70. Edwin is recorded in the 1850 census of Wethersfield, Hartford Co., Ct, as a day laborer. [S25] Hannah McPherson, Holcombe Genealogy, Page 103.2/Item A-8-1-1-2-7-1-3. 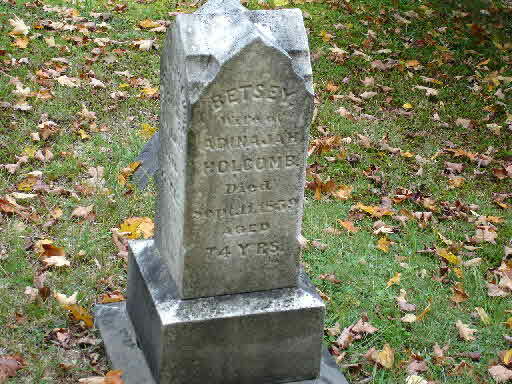 Betsey A. Holcombe was born on 25 December 1814 at Granby, Hartford Co., CT. She was the daughter of Adonijah Holcombe II and Betsey Hillyer. Chloe I. Holcombe was born on 5 January 1817 at Granby, Hartford Co., CT. She was the daughter of Adonijah Holcombe II and Betsey Hillyer. Charity C. Holcombe was born on 9 September 1820. She was the daughter of Adonijah Holcombe II and Betsey Hillyer. Azubah Helding was born on 26 July 1812 at CT. She married Edwin Holcombe, son of Adonijah Holcombe II and Betsey Hillyer. Azubah Helding died on 14 July 1873 at age 60. Walter Edwin Holcombe was born on 29 May 1835 at CT. He was the son of Edwin Holcombe and Azubah Helding. 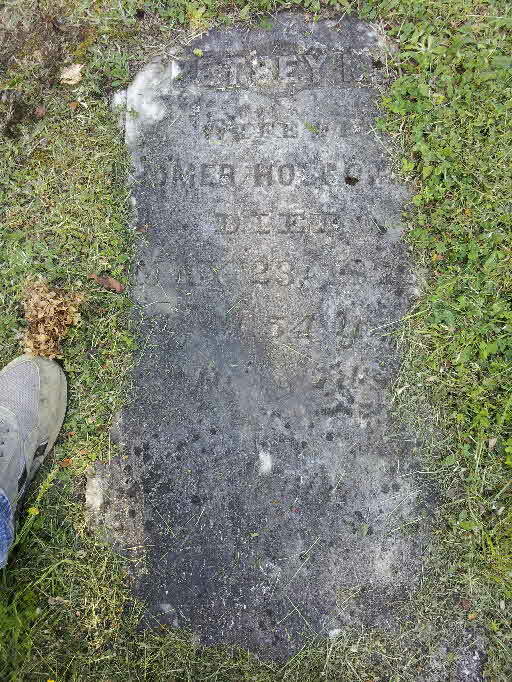 Walter Edwin Holcombe died in December 1887 at age 52. [S25] Hannah McPherson, Holcombe Genealogy, Page 103/Item A-8-1-1-2-7-1-3-1. Anna Elizabeth Holcombe was born on 15 June 1838 at CT. She was the daughter of Edwin Holcombe and Azubah Helding. Homer Holcombe was born on 3 January 1812 at CT.3,4 He was the son of Nathaniel Holcombe VII and Thankful Holcombe. Homer Holcombe married Betsey Maria Darrin on 16 November 1840. 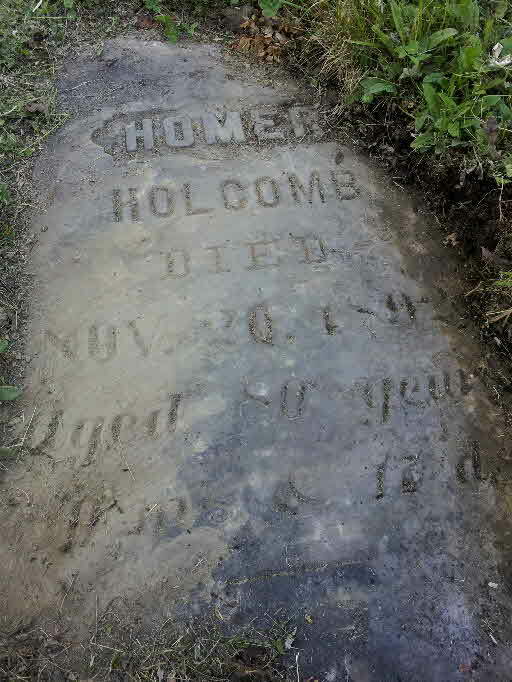 Homer Holcombe died on 20 November 1892 at Colesville, Broome Co., NY, at age 80. Homer and his family are recorded in the 1850 census of Colesville, Broome Co., NY as farmers. He was 35, she was 31, Edgar W. was 8, Stephen S. 6. Homer and Betsey were enumerated in the 1860 Colesville, Broome Co., NY, federal census, page 21 (stamped page 695). He was a farmer age 47, she was 41. Children in the household were Edgar 18, Smith 16, and Nathaniel 5. Homer and Betsy were enumerated in the 1870 Colesville, Broome Co., NY, federal census. He was a farmer age 58, she was 51. Children in the household were Nathaniel 16, Smith 26, and Betsey A. 5 (apparently daughter of Smith whose first wife had apparently died at this point). Homer was enumerated in the 1880 Colesville, Broome Co., NY, federal census. He was a farmer age 68. Also in the household were son Nathaniel Alanson 26 and his wife Jennie 26, and grandchildren (listed as nieces and nephews) Minnie 8, Smith 7, Ora 5, and Anga 2. [S25] Hannah McPherson, Holcombe Genealogy, Page 103.2/Item A-8-1-1-2-7-5-1. Imri Holcombe was born on 30 May 1814. He was the son of Nathaniel Holcombe VII and Thankful Holcombe. Imri Holcombe married Sophronia Frank. Irmi and Elizabeth were enumerated in the 1850 census of Colesville, Broome Co., NY, page 31; he was a farmer age age 36; she was 31. Sisters Chloe and Pamelia were also in the household. Andrew and Louisa were both listed as 10, Seba was 4. Irmi and Sophronia were enumerated in the 1860 Colesville, Broome Co., NY, federal census, page 21 (stamped page 695). He was a farmer age 45, she was 35. Children in the household were Louisa 15, Seba 14, Dora 3, and Frank 1. "Emri" and Sophrona were enumerated in the 1870 Colesville, Broome Co., NY, federal census. He was a farmer, age 55; she was 44. Children in the household were Selia 24, Dora 13, Frank 11, Charles 9, Fred 5, and Burton 3. [S25] Hannah McPherson, Holcombe Genealogy, Page 104.1/Item A-8-1-1-2-7-5-2. Fidelia Holcombe was born in 1817 at CT. She was the daughter of Nathaniel Holcombe VII and Thankful Holcombe. Lewis and Fidelia were enumerated in the 1880 Fenton, Broome Co., NY, federal census. He was 54, she was 61. The only other person in the household was Pamelia Holcombe, age 59. Pameal is recorded in the 1850 census of Colesville, Brome Co., NY living in the home of her brother, Imri. Pamelia Holcombe was born on 1 December 1819 at NY. She was the daughter of Nathaniel Holcombe VII and Thankful Holcombe. Chloe Holcombe was born on 17 January 1828 at NY. She was the daughter of Nathaniel Holcombe VII and Thankful Holcombe. Andrew Jackson Holcombe was born on 19 January 1833 at NY. 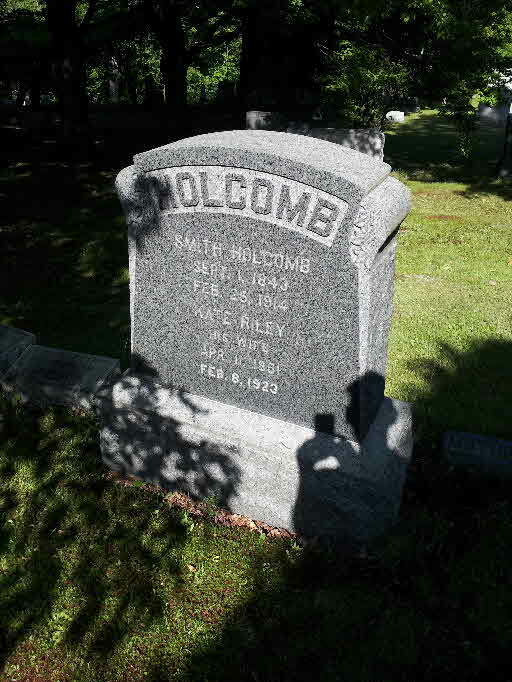 He was the son of Nathaniel Holcombe VII and Thankful Holcombe. 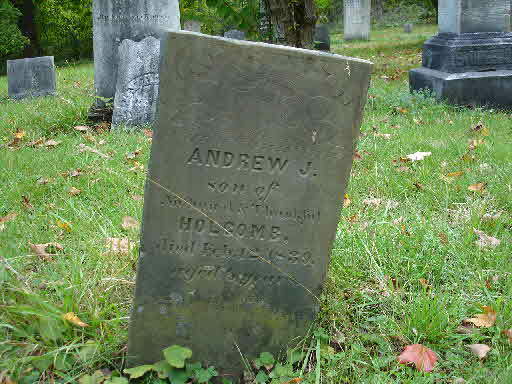 Andrew Jackson Holcombe died on 12 February 1839 at age 6. He was buried at New Ohio Cemetery, North Colesville, Broome Co., NY. Betsey Maria Darrin was born in 1819 at OH. She married Homer Holcombe, son of Nathaniel Holcombe VII and Thankful Holcombe, on 16 November 1840. Betsey Maria Darrin died on 23 May 1873 at Colesville, Broome Co., NY. She was buried at New Ohio Cemetery, North Colesville, Broome Co., NY. [S104] DAR DAR Lineage book, Vol. 55/Item 54112. [S153] In collaboration with Lyman Edgar Cooley and Ernest Linwood Cooley, compiled by Vivien Bulloch Keatley Mortimer Elwyn Cooley, Cooley Genealogy, Page 591/Item 332. [S66] Mark Williams Granby VR, Page 245. [S419] Carol Laun, Beneath These Stones, Page 34. Elizabeth B. Cooley was born in 1813 at Granby, Hartford Co., CT. She was the daughter of Philetus Cooley and Polly Hinman. Jane Elizabeth Burgess was born in 1833 at Palmer, MA. She was the daughter of Joseph Clark Burgess and Elizabeth B. Cooley. Jane Elizabeth Burgess died on 2 January 1882 at Palmer, MA. Frank Keys Foster was born on 19 December 1854 at Palmer, MA. He was the son of Charles Dwight Foster and Jane Elizabeth Burgess. Frank Keys Foster died on 27 June 1909 at Belmont, MA, at age 54. Cecile Ella Foster was born on 3 October 1884 at Haverhill, NH. She was the daughter of Frank Keys Foster and Lucretia Ella Ladd. Cecile Ella Foster died on 7 November 1914 at age 30. Edgar W. Holcomb aged 71 years, died at his home near Windsor, Monday, December 30th. He was a veteran of the Civil War. For the past twelve years he has been a sufferer from cancer. Mr. Holcomb was twice married; in 1866 to Rosetta Wood, and in 1898 to Ada Knott, who survives him, and has very tenderly cared for him during his long illness. Three children by his first marriage survive him; Mrs. Wm. Jewell, East Guilford; Homer Holcomb, Blodgett's Mills; George Holcomb, Harpursville; also a brother, Smith Holcomb, Tunnel. The funeral service was held at the home of his son, George D. Holcomb, Thursday, January 2nd, at 1 o'clock. Rev. E. Haner of Ouaquaga officiated with burial in the New Ohio cemetery. [S25] Hannah McPherson, Holcombe Genealogy, Page 103.2/Item A-8-1-1-2-7-5-1-1. 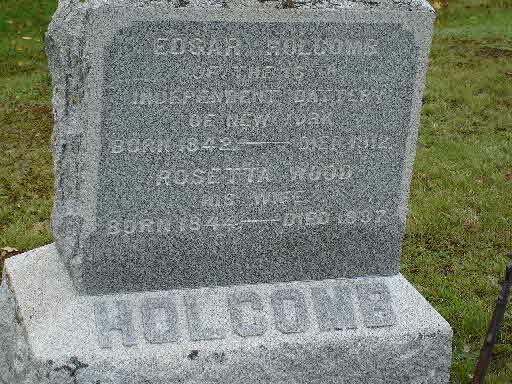 [S807] Find A Grave, online http://www.findagrave.com, Find A Grave, database and images (https://www.findagrave.com : accessed 10 November 2018), memorial page for Edgar Holcomb (1842–1912), Find A Grave Memorial no. 95511080, citing New Ohio Cemetery, Belden, Broome County, New York, USA ; Maintained by Paul R (contributor 47317162) . Stephen Smith Holcombe was born on 11 September 1843 at Tunnell, Broome Co., NY. He was the son of Homer Holcombe and Betsey Maria Darrin.2 Stephen Smith Holcombe was also known as Smith Holcombe. He married Mary (?) Stephen Smith Holcombe married Katherine A. Riley on 28 June 1871. Stephen Smith Holcombe died on 25 February 1914 at age 70. He was buried on 28 February 1914 at New Ohio Cemetery, North Colesville, Broome Co., NY. "S. G." and Catherine were enumerated in the 1880 Colesville, Broome Co., NY, federal census next to his father. He was a farmer age 37, she was 28. Children in the household were Betsey 15, and Rachel 2. [S35] 1900 Federal Census, unknown repository address, Year: 1900; Census Place: Colesville, Broome, New York; Page: 1; Enumeration District: 0032 Ancestry.com. Maria Letitia Holcombe was born on 17 March 1851 at Tunnell, Broome Co., NY. 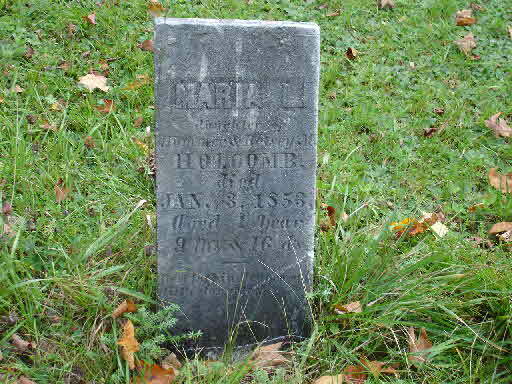 She was the daughter of Homer Holcombe and Betsey Maria Darrin.1 Maria Letitia Holcombe died on 3 January 1853 at age 1. She was buried at New Ohio Cemetery, North Colesville, Broome Co., NY. Nathaniel Alanson Holcombe was born on 5 June 1854 at Tunnell, Broome Co., NY. He was the son of Homer Holcombe and Betsey Maria Darrin.2 Nathaniel Alanson Holcombe was also known as N. A. Holcombe. He married Jennie Fay circa 1870. Nathaniel Alanson Holcombe died in 1912. He was buried at New Ohio Cemetery, North Colesville, Broome Co., NY. N. A. and Jammie were enumerated in the 1880 Colesville, Broome Co., NY, federal census in the household of his father, Homer. He was a farmer age 26, she was 26. Children in the household were Minnie 8, Smith 7, Ora 5, and Anga 2. Nathaniel and Emma J. were enumerated in the 1900 Colesville, Broome Co., NY, federal census. He was a farmer age 46, she was 46. They had been married 29 years and had 6 children all still living. Children in the household were Eva 13 and Hugh 9. "Nath" and Jennie were enumerated in the 1910 Colesville, Broome Co., NY, federal census. He was a farmer age 55, she was 55. They had been married 38 years, the first marriage for both, and had 6 children all still living. Children in the household were Minnie 36, and Hugh L. 19. McPherson suggested another wife and son Edgar but the 1910 census confirms that they had been married 38 years and it was the only marriage for both. Nathaniel died shortly after that. It seems logical that following Nathaniel's death that Jennie married a Hayes and on her death was buried witih Nathaniel and Minnie. N.A. 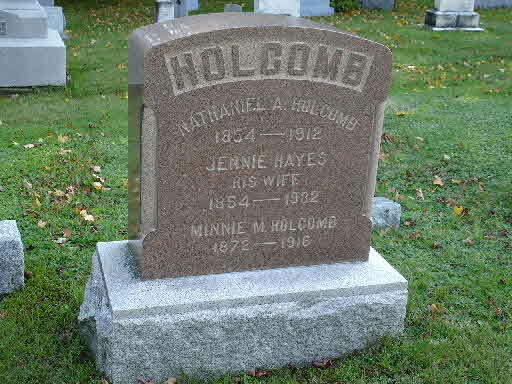 Holcomb died at his home at Tunnel [Broome Co., NY], May 11, 1912, at 2 o'clock p.m. after an illness of several months. He is survived by a wife, four daughters, Mrs. Chas. Goodsell of Bakers Corners, Mrs. Geo. Christman of Sanitaria Spr., Minnie and Eva of Schenectady and two sons, Smithie of Cambridge, N.Y. and Hugh, who lives at home. Two brothers, Smith of Tunnel and Edgar of Ouaquaga. Funeral will be held Tuesday at 1 o'clock at the home of the deceased. [S25] Hannah McPherson, Holcombe Genealogy, Page 104.1/Item A-8-1-1-2-7-5-1-4. [S25] Hannah McPherson, Holcombe Genealogy, Page 104.1/Item A-8-1-1-2-7-5-1-5. Rosetta Wood was born in 1844. She married Edgar Wallace Holcombe, son of Homer Holcombe and Betsey Maria Darrin, in 1865. Rosetta Wood died in 1897. Lutitia attended the Holcombe reunion, Philadelphia, 1926. Lutitia Holcombe married William H. Jewell. Lutitia Holcombe was born on 23 October 1866 at Broome Co., NY. She was the daughter of Edgar Wallace Holcombe and Rosetta Wood. Lutitia Holcombe died on 28 July 1928 at age 61. Homer Ward Holcombe was born on 5 December 1871 at Broome Co., NY. He was the son of Edgar Wallace Holcombe and Rosetta Wood. Homer Ward Holcombe married Lucy M. Baker. Homer Ward Holcombe died on 26 May 1946 at age 74. The census records do not match McPherson exactly. Homer and Ines were enumerated in the 1910 Courtlandville, Cortland Co., NY, federal census. He was 38, married three times; she was 25, married once. Children in the household were Newton, 10, Howard 8, and Florence 4. Homer and Inez were enumerated in the 1920 Virgil, Courtland Co., NY, federal census, ED 241. He was a farmer, age 48, she was 35. Children in the household were Newton 19, Howard 18, Florence 14, Lawrence 9, and Virginia 3. [S25] Hannah McPherson, Holcombe Genealogy, Page 104.1/Item A-8-1-1-2-7-5-1-1-2. George D. Holcombe was the son of Edgar Wallace Holcombe and Rosetta Wood. Possibly the George D. Holcomb, 70, of 29 Court Street, who died suddenly Saturday at the home of his son, Ralph Holcomb, in Smyrna [Chenango Co., NY]. He was born in Smithville, May 9, 1881. During his lifetime he was engaged in retail business in Norwich [Chenango Co., NY], and for about 14 years just prior to retiring he operated a milk delivery route for the Bliven Dairy. Surviving, besides the son, are his wife; a daughter, Mrs. Joseph McNeil of Norwich, and 11 grandchildren and 10 great-grandchildren. Funeral arrangements were made at the Breese Funeral Home. The funeral will be tomorrow at 1:30 p.m. at the residence, and at 2 p.m. in Emmanuel Episcopal Church. The Rev. Lloyd S. Charters, rector, will officiate. Burial will be in the New Ohio Cemetery near Tunnel [Broome Co., NY]. [MHD notation: d. June 2, 1951] There is a FindAGrave memorial 76104160 in this cemetery for a George but without any information that woud connect him to Edgar and Rosetta.